How would you like to receive a love letter from God? Something that explains how God really feels about you, how He can help you through difficult times, and how He encourages you? God's Word, the Bible, is the ultimate love letter written to us to help us on our life-long journey. But, for young children, there is a new release from Ideals Books written by author P.K. Hallinan. 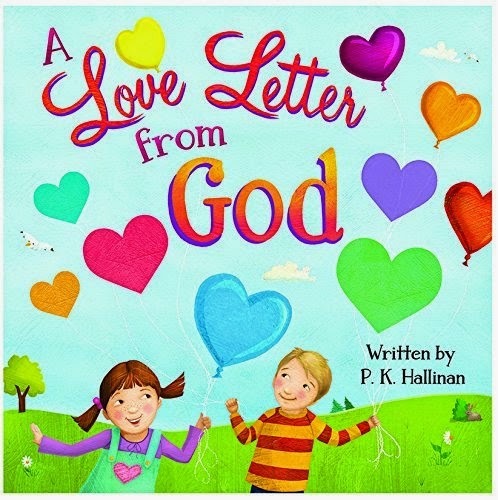 It is a delightful children's book called, A Love Letter from God. to help make you STRONG! From there, the book goes on to show the many blessings God has given us - things we can experience every day if we only open our eyes and our hearts to receive them. This is a meaningful and enjoyable book to snuggle on the couch and read to your little ones. I like it very much and will add it to my library. The giveaway will originally set to close on January 6, but it has been EXTENDED TO JANUARY 9th, 8:00 p.m. CST. One winner will be randomly chosen by Giveaway Tools. I will contact you via e-mail if you have won and will allow 24 hours for a response before moving on to the next person. The book will be mailed directly to the winner by FLYBY PROMOTIONS. You're the second blogger that I've seen post about this book. Looks super sweet! Did you enter through the Giveaway Tools entry form above? There was previously a problem with the link, but it has been fixed. So, if you tried to enter, please do it again. Thanks!